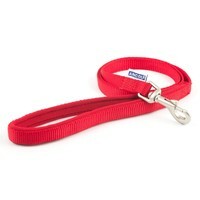 Ancol Padded Nylon Dog Lead 1m is a durable and weather-proof lead that features a handle lined with soft, breathable neoprene for a comfortable grip. Industrially sewn with a unique “flag” pattern for additional strength and durability, the Ancol Padded Lead is perfect for walking dogs that have a tendency to pull, as the neoprene handle won’t dig uncomfortably into your hand. The Ancol Padded Lead also features a trigger hook in a satin-finished metal that can be easily attached to your dog’s collar or harness.